Spectre is sure to be one of the biggest movies of the holiday season, arriving in theaters November 6th, just in time for all the fall festivities associated with the Day of the Dead. That Mexican Celebration, which kicks off on October 31 and ends November 2nd, serves as an action centerpiece in this latest James Bond adventure. And the sugar skull often associated with the massive prayer gathering is front and center on the latest poster. It's a foreboding image, teasing some very bad things on the horizon for the world's greatest secret agent. In Spectre, a cryptic message from the past sends James Bond (Daniel Craig) on a rogue mission to Mexico City and eventually Rome, where he meets Lucia Sciarra (Monica Bellucci), the beautiful and forbidden widow of an infamous criminal. Bond infiltrates a secret meeting and uncovers the existence of the sinister organisation known as Spectre. As Bond ventures towards the heart of Spectre, he learns of a chilling connection between himself and the enemy he seeks, played by Christoph Waltz. As you can tell by the poster, The Day of the Dead will loom quite heavily over the story in Spectre. This 007 adventure kicks off with an epic chase sequence. The scene in question took nearly ten days to shoot, and utilizes more than 1500 extras all decked out in Day of the Dead make-up. The scene features James Bond meeting Estrella (Stephanie Sigman) in the crowded streets surrounded by giant Skeleton floats and other larger-than-life decorations. They hurry to make their way through the massive parade, arriving at the Gran Hotel De La Ciudad De Mexico, where Estrella believes she is about to be seduced. Bond has other things on his mind, though, as he stares out the hotel window, fixated on two men having a conversation. Bond stops something really bad from happening, killing one of these men while giving chase to the other. They eventually both find themselves hanging from a helicopter. It is said that the stunt pilot, Chuck Aaron, is the only man in the world insured to do 360 degree flips in his helicopter, which we're likely to see on screen. Day of the Dead (aka Día de Muertos) is a Mexican holiday celebrated throughout Mexico, in particular the Central and South regions, and acknowledged around the world in other cultures. The holiday focuses on gatherings of family and friends to pray for and remember friends and family members who have died, and help support their spiritual journey. 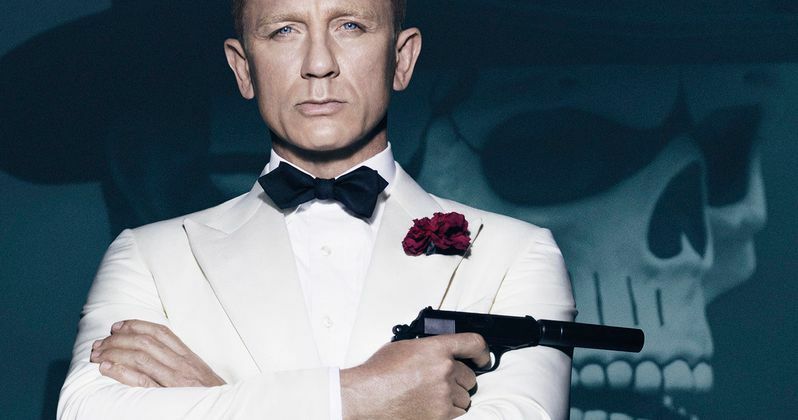 These will surely be underlying themes in Spectre, as Bond comes face-to-face with his past. It's speculated that Spectre may be the final Bond movie for Daniel Craig, and director Sam Mendes has already said that he's not returning. Of course, they could change there mind. If they don't, you better enjoy. This is some of the last Daniel Craig 007 Bond swag we'll ever get!